What is a share membership? In order to participate in our credit union, you must purchase a membership share at a cost of $25, which entitles you to utilize our financial products and services, vote at our annual meeting and be eligible to run for our board of directors. Holding a membership in our credit union means you are not just a customer, you are an owner. How do I open a personal account? To open a personal bank account, you can come into either office location with the required identification; no appointment is required. Contact our reception desk to clarify documentation requirements and make an appointment at either office location to come in and open the account. What identification is acceptable for opening an account? To open a personal bank account, one piece of original valid government issued (federal, provincial or territorial) photo identification is required for each account holder. A health card is not an acceptable form of identification in Ontario. For other types of acceptable identification to open an account, please contact our reception desk for assistance. Can I receive direct deposits and automatic withdrawals? You can receive direct deposits into any type of account at the Dundalk Credit Union. For direct deposits going into savings accounts please obtain a credit union letter confirming your banking details. Automatic withdrawals can be processed through any Dundalk Credit Union chequing account. How do I receive my bank statement? Bank statements are produced at each month end and can be picked up with your original cheques in person at your branch location within 10 banking days. Bank statements can also be produced at any time through online banking. Bank statements may be mailed at your request for a fee. Bank with Dundalk Credit Union and experience friendly, helpful service at one of our office locations or use our self-serve options for your 24 hour banking needs. For your personal borrowing needs, please contact our Personal Loans & Residential Loans Officer. For your agricultural related borrowing needs, please contact our Agricultural Account Manager. For your business related borrowing needs, please contact our Commercial Account Manager. If you are a small business owner or looking at starting your own business, go to https://www.ontario.ca/page/business-name-registration for some useful information! Are you looking to start a direct deposit to or a direct withdrawal from your Dundalk Credit Union bank account? 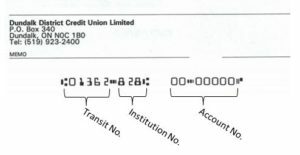 You can also find this information at the bottom of your cheque as show in the picture to the right. If you need further assistance please contact either location. We have changed our transit and institution numbers effective October 2, 2017.
the institution number is now 828. All member cheques must have the new transit and institution numbers effective January 1, 2019. Please contact either location for further assistance.